Galan Lithium (“Galan” or “the Company”) is concentrating activities on its 100% owned lithium tenements located over Salar de Hombre Muerto in Catamarca and Salta Provinces, Northern Argentina. Salar de Hombre Muerto is a proven lithium producer, with Livent (NYSE. 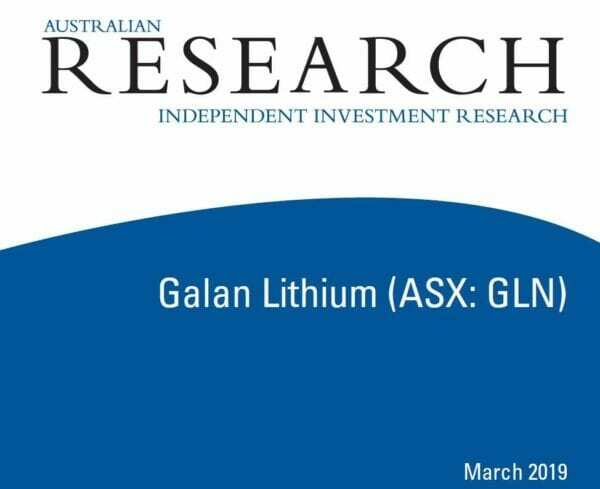 LTHM, formerly FMC) having operated the Fenix lithium operation since 1992, and Galaxy Resources (ASX.GXY, “Galaxy”) looking to develop the 100% owned Sal de Vida Project – Galaxy has recently sold part of its large Sal de Vida Resource to POSCO for US$280 million, with the funds to be put towards development of Sal de Vida. Galan’s first drill hole on the Candelas property, adjacent to Sal de Vida on the eastern side of the salar, has returned 165 m of high grade, low contaminant lithium brines, highlighting the prospectivity of Candelas. This supports results of recent gravity and controlled source audio frequency magneto-tellurics (“CSAMT”) surveys which defined a potential brine reservoir with a length of 15 km, a width of 3 km to 5 km and thicknesses between 160 m and 400 m. Drilling is ongoing, with a view to an initial Mineral Resource Estimate (“MRE”) in the short term.